It’s a sticker!” That's how an exasperated Senator Anthony Chisholm (ALP) began his opposition to a Senate motion moved by Senator Ian McDonald (LNP) expressing disgust at the actions of the QTU in distributing material bearing the Eureka flag. But why did a humble sticker create such hysteria and draw such vitriol? With the Queensland Certificate of Education (QCE) system commencing next year, there has been a flurry of activity across the state in preparation for the biggest shake up of senior assessment that Queensland has seen for 40 years. From the VP: Campaign with your colleagues and get it done! 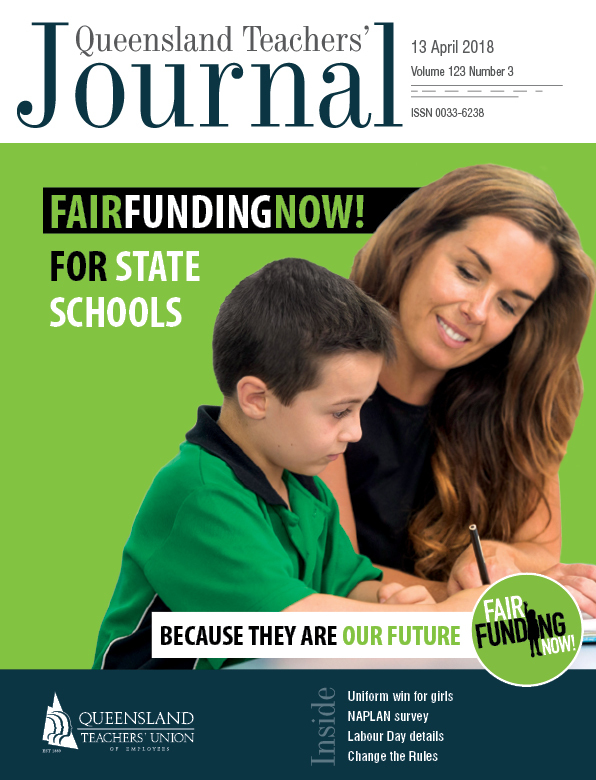 Want to make a real difference to the future of school funding? Join the campaign for Fair Funding Now! 360 QTU workplace representatives from across the state came together at the RNA International Convention Centre in Brisbane for the annual Union Reps Conference, titled “Strengthening workplace activism". The Promotional Positions Classification Review continues, and both the department and the QTU appreciate members taking the time to contribute to ensure high-quality outcomes can be achieved. All life on Earth follows a rhythm that’s governed by the 24-hour oscillation between day and night, light and dark. Living in synchronicity with this cycle is key to our health and wellbeing.